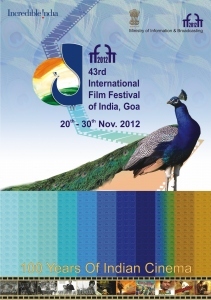 The stage is set for the 43rd International Film Festival of India (IFFI) beginning tomorrow amidst genial surroundings of Goa to promote some of the best cinemas of India and the world. The 10-day cinematic extravaganza which promises to be a showcase of the glorious hundred years of Indian cinema will look back at the magic of Indian cinema in a never seen before avatar. With the galaxy of stars like Akshay Kumar, Irrfan Khan, Tabu, Om Puri, Jackie Shroff, Vinay Pathak, the opening ceremony promises to be one of the greatest celebrations of the centenary year of Indian Cinema. While the opening festival will see popular Bollywood star Akshay Kumar as the Chief Guest, the cultural celebrations will bring together ace Bollywood Choreographer Saroj Khan, much appreciated Bollywood singer Kailash Kher, along with a bevy of stars on a singular podium. As a part of the international presence, the cine lovers will be treated to the company of renowned Polish Director Krzysztof Zanussi who will be conferred the Lifetime Achievement Award, Kim Ki-duk, Michael Winterbottom, Susanne Bier amongst others. Briefing the media here, Shri Shankar Mohan, Festival Director, IFFI said, at the festival one can look forward to the international premier of Ang Lee’s much anticipated 3D Film ‘Life of Pi’, and also Kim Ki-duk’s much awaited movie ‘Pieta’. Apart from showcasing cinema of varied cultures of the world, the festival will also bring together stalwarts like Nitin Desai, Resul Pookutty, Debabrata Pain, Shyam Benegal, Avy Kaufman, Adoor Gopalakrishnan and David Womark taking Master Classes which will provide the audience with an opportunity of interacting with the masters themselves and learn the nuances of filmmaking. As a first of its kind initiative, Canon will do a technical workshop to increase knowledge about the nuances of filmmaking. In the 43rd edition of IFFI, over a hundred movies will be screened as a part of the Indian Cinema and the World Cinema segments. The Indian Section will bring to the audience movies from across the country in the Indian Panorama (Feature and Non-Feature Section) which is selected by a core jury headed by Buddhadeb Dasgupta for the Feature and M R Rajan for the Non-Feature section. The Indian Panorama will screen twenty feature films with ‘Baandhon’ director by Jahnu Barua as the Opening film, and nineteen films in the non-feature section with ‘Celluloid Man’ directed by Shivendra Singh Dungarpur as the Opening film. Apart from the Indian Panorama, the Indian section will bring to the audience varied films in different sections like ‘100 Years of Indian Cinema-A Celebration (Feature & Non-Feature)’ showcasing choice of movies from the glorious hundred years of Indian cinema, ‘FTII: Young at 50’ which will showcase films from Film and Television Institute of India’s glorious fifty years, Retrospective of Soumitra Chatterjee, Special Tribute to Girish Kasaravalli and Muzaffar Ali, Vintage: A Tribute to Masters showcasing works of Mrinal Sen, Adoor Gopalakrishnan, Shyam Benegal, D Ramanaidu and K Balachander; Homages to Yash Chopra, Dev Anand, Rajesh Khanna, Navodaya Appachan, T Damodaran, Ashok Mehta, Rajen Kothari, AK Hangal, Dara Singh, Joy Mukherjee, Dinesh Thakur and Ravi Shankar Sharma; along with a showcase of Students’ Package and a package of movies celebrating Incredible India. Apart from the International Competition, the cine lovers at the 43rd IFFI will be treated to a varied line-up of world cinema which will be showcased in sections like ‘Cinema of the World’ which will have a showcase of fifty-one films from forty-two countries with Ang Lee’s 3D film ‘Life of Pi’ as its Opening Film and Mira Nair’s ‘The Reluctant Fundamentalist’ as its Closing Film. Other sections in the International section include ‘A Cut Above’, ‘Masterstrokes’, ‘Festival Kaleidoscope’, ‘Turkish Currents’, ‘Sketches on Screen’, ‘Retrospective: Susanne Bier’, ‘Special Tribute: Ashok Amritraj’, ‘In Focus: Kim Ki-duk’, ‘Soul of Asia’, ‘Documentaries’ and ‘Homages’.